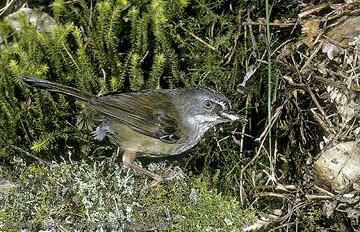 The Tasmanian (or Brown) Scrubwren is often regarded as an island inhabiting subspecies of the widespread White-browed Scrubwren. It is restricted to Tasmania - even nearby Flinders Island is home to a different subspecies. 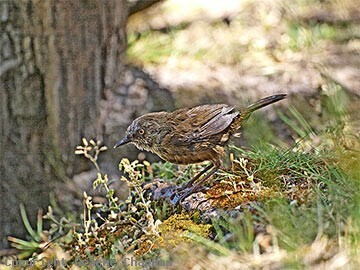 Tasmanian Scrubwrens differ from mainland birds by their less obvious facial markings. Their biology is probably much the same. 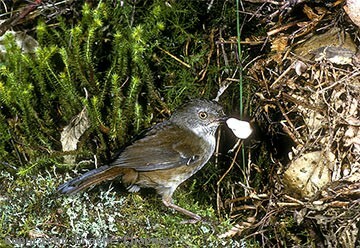 495201 ... Tasmanian Scrubwren removing faecal sac, St. Helens, Tasmania. 495206-D ... Tasmanian Scrubwren, immature after a bath.